Title winners Crusaders celebrated a NI Football Writers' awards double with Billy Joe Burns and Stephen Baxter winning the top honours. Full-back Burns followed up his Ulster Footballer of the Year award by being named Player of the Year. Baxter won the Manager of the Year award for a second straight season. Glenavon's Joe Cooper was Young Player of the Year and NI manager Michael O'Neill was named the International Personality of the Year. 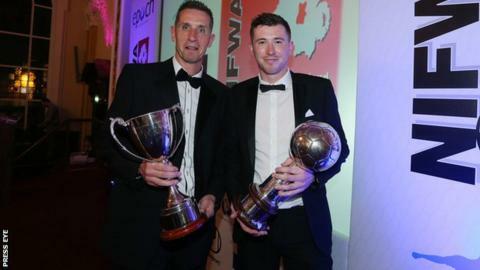 Lurgan Blues stopper Jonathan Tuffey was voted top keeper while David Cushley's superb lob for Ballymena against Linfield earned him Goal of the Season. Former Northern Ireland defender Mal Donaghy and former Portadown boss Ronnie McFall were inducted into the Dr Malcolm Brodie Hall of Fame at the awards ceremony in Belfast City Hall.